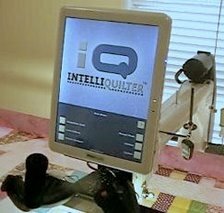 Patty Butcher explains the resize quilt button and aspect ratio in this video. The one time I've found this useful was when I had stitched and saved a wholecloth quilt that was about 40inches square. I then decided to make a miniature quilt exactly the same, so I simply resized the quilt, with the aspect ratio locked, down to 24inches square. It looked exactly the same on the screen but turning on the grid, or going to true size, showed how the whole quilt had been scaled down. I stitched it out at that size too. At the smaller scale I had to reduce the speeds on iQ to get an accurate stitch out. Why would you want to do this? If you had made a quilt for a child and wanted to make the same one for their doll, or pet.